The fisheries producing the Greenland prawns and halibut still represent Greenland’s most important industry, and the grant from Denmark is still the country’s largest source of money. The dream is for mining and perhaps oil to make up a larger part of the revenue. Our short trip to Ilulissat, Greenland’s third city, gave us a good insight into the nature, culture and a changing society where tourists are offered four star experiences. Greenland is part of the Nordic region, an autonomous area under Denmark and still it feels so exotic. The nature makes a huge impression. It is not like Northern Norway, or Iceland. Even Svalbard seems milder than this rugged coastal landscape surrounded by sea and land ice. The Nordic Committee of Senior Officials for Labour is visiting Greenland to learn more about conditions there and to tell each other about new initiatives in their respective countries. The modernisation of the Nordic cooperation was also on the agenda. The Nordic Labour Journal has been invited to talk about adapting new technology. The question is whether the committee will grant money for a new design adapted to mobile platforms. But Ilulissat’s best hotel houses more than conference participants and tourists. I had seen them several times already. They sat in the same sofa in the hotel lobby as I walked past. A couple in their late sixties. He was well built, wearing a jumper featuring the head of a polar bear. She sat close to him. I just had to stop, what’s with the polar bear? As I approached the couple on the sofa they took each other’s hands and looked quizzically at me. Surprisingly they spoke only Greenlandic. Language became a challenge. I had to ask one of the hotel staff if she could help interpret. She was a Greenlander too, from the same village it turned out, and she spoke Danish. All Greenlanders working in the hotel must be trilingual, the hotel’s general manager told me later. They must speak English, Danish and Greenlandic. Language is an issue for debate in Greenland. Children mainly learn Greenlandic in school. When they go to college they are often taught in Danish, using Danish textbooks. But their language skills are often not good enough, says Jess G. Berthelsen, leader of Greenland’s largest trade union SIK, who thinks it is time English became the second language instead of Danish. That would help Greenlanders communicate in a globalised world. The Greenlanders in the sofa introduced themselves as Julie and Josef Løvstrøm. Both were retired and came from a small city not far from Ilulissat where the airport is. Now they were on their way to the capital Nuuk. Hotel Arctic is a four star hotel owned by Air Greenland A/S, the national airline. It is beautifully located on a hill outside of Ilulissat with a view of the city and the icebergs in the bay beyond. From here you can also see the drift ice which now in spring makes it look as if the surroundings are continuously changing. With nothing else to do it would be easy to just sit for hours and study the natural drama with the rapidly changing weather offering sun and snow, wind and blizzards. Not only that: between the hotel and the view towards drift ice and ice bergs we spot 12-15 Greenland dogs in the snowdrift, ready to pull you through clean, white and wild landscapes of ice and snow, I imagine. “I like polar bears,” says Josef Løvstrøm through the interpreter. It’s as simple as that. But there is more. He has seen two polar bear close up. It was in 1965. He was dog sledding when he spotted the bears not far off, but he got away. The story stops there, but it has clearly made a mark. “Living is hard here,” says Julie Løvstrøm. Strange in a way, because you would have thought that people who live in a cold and rugged place do not care so much, but they do. 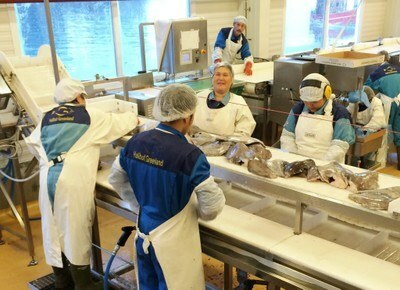 The next day we visit the fish processing plant and are told that during summer when the midnight sun shines, workers take three months off between June and August. They want to enjoy the brief summer, spend time in the nature and hunt and fish. They want to gather new strength and collect food for the long winter ahead. “I understand it well,” says Lars Sandegreen. He is head of projects and development at the local fish processing plant Halibut Greenland Ap. During summer the plant hires workers from elsewhere. This year they are cooperating with the Nordic Nordjobb programme, which has helped them find ten young summer workers. One way of increasing revenues is to develop sustainable raw material production. There is already mining and mineral exploration, but the big potential is still some way off being fulfilled, and so far not enough offshore oil has been found to warrant production. They are most optimistic about small mines with a short lifespan. Most Greenlanders, nearly 10,000, work in the public sector — more women than men. Fisheries come second, employing some 3,500 people. Royal Greenland is considered a flagship for Greenland’s economy, according to Jess Berthelsen, head of the nationwide SIK trade union. Still most employees in the fisheries industry are sent home for parts of the year. Some 700 professional fishermen need to top up their earnings with unemployment benefits during those periods. Lars Sandegreen at Halibut Greenland Ap is very critical to the way Greenland’s fisheries sector is run, how the quotas are administered and distributed and how the state owned Royal Greenland fishing company is run. “Halibut Greenland is run according to a philosophy, not just a strategy,” says Lars Sandegreen. The company was founded by local coastal fishermen because they felt their returns were too low when they supplied Royal Greenland’s processing plants with fish. Royal Greenland also has a plant in the Ilulissat harbour, right opposite the Halibut Greenland plant. Halibut Greenland is a cooperative. Their philosophy is to empower local fishermen to the benefit of citizens and the local community as a whole. When the fisherman has ownership, he can get more money for the fish. The environmental aspect is important too; running the fisheries in a sustainable way, avoiding overfishing, ensuring good working conditions for fishermen. “This is about seeing the local fisherman as an investor in a fish factory and not only a supplier to a fishery plant who takes a certain price per kilo,” says Lars Sandegreen. As the company’s head of development he would have liked to land and process the fish here in Ilulissat before exporting it around the world, but today the fish is frozen and shipped to Denmark before being exported globally. The annual block grant from Denmark, which in 2014 was 3.7bn Danish kroner (€500m), is the largest contribution to Greenland’s economy. Other main sources of income are fisheries, production and tourism. Hotel Arctic is a flagship. Its location, the proximity to the powerful nature, the service and not least the food is all top quality. The head chef, Jeppe Ejvind Nielsen, has won the Greenlandic championship three times and is constantly looking for ways to improve. He is Danish, trained in Copenhagen where he worked for ten years before travelling to Nuuk in Greenland and later to Ilulissat and Hotel Arctic where he has spent “five to six years”. “What’s so good with living here is the freedom, both professionally and personally. You are allowed to be yourself. It is important to have the space to be human, to be social without people expecting too much from you. I like that a lot,” say Jeppe Ejvind Nielsen. The minimum wage in Greenland is 86 kroner (€11.50) an hour. That means an annual pay of 168,000 kroner (€22,500) which is far below the Nordic average. The hourly rate in fish processing plants is around 95 kroner (€12.70), according to the SIK trade union. What are the challenges with living her? “Of course being so isolated presents some particular challenges. When the weather is like it is now, with blizzards and poor visibility, planes cannot take off or land. So we won’t get the vegetables, which should arrive once a week, until tomorrow or the day after. “So we just have to think of something else,” he says breezily. Or as the hotel’s general manager says when we meet: It is hard at first but you get used to it. But head chef Jeppe Ejvind Nielsen also talks enthusiastically about the opportunities presented by nature. Josef and Julie Løvstrøm have also got used to waiting. They are waiting to get to the hospital in Nuuk. He is nearly blind on one eye and has been diagnosed with cancer, but the planes to the capital are not taking off. So hospital must wait. They are softly spoken. He has been fishing and hunting in the past, but that’s over. She has worked in the local shop in her home town. They have four children and grandchildren, but apart form that they are on their own, they say through the interpreter. “We are lonely, it is difficult to find friends because we don’t drink, we are teetotallers. Nobody wants to spend time with people who don’t drink. Hotel Arctic has 10,000 guest nights a year. One third are tourists, and the number is rising. One third are seminar participants like the ones from the Nordic Committee of Senior Officials, and one third are business people and ordinary people like Julie and Josef Løvstrøm who are stuck waiting for better weather. In the summer the deliveries aren’t such a problem. Between July and the end of August the kitchen exclusively uses local ingredients which the cooks themselves have been gathering. The Danish gourmet restaurant Noma has made people across the Nordic region aware of the amazing raw ingredients which can be found right on their doorstep. That knowledge also helps develop Jeppe Ejvind Nielsen’s kitchen. “When I started I focused a lot on looks. Now I am much more into developing tastes and to make the meal a comprehensive sensory experience,” he says. Last summer, for instance, the restaurant served a piece of halibut fresh from the Icefjord. It was arranged on a block of inland ice with a side salad of local seaweed, sago chips and topped with some snow. At the base, some dry ice. When serving the dish, the waiters rolled the seaweed down from the iceberg and poured a warm extract of seaweed over it. The smoke looked like sea fog and it smelled of the sea. It is strange to experience such luxury in this weatherworn piece of east coast on the world’s largest island. Before 1959 Greenland was a Danish colony. Since 1979 it has been an autonomous region where the local government has been granted powers over an increasing number of policy areas. The areas are enormous, covering Denmark 50 times over, but 80 percent of the island is covered by permanent ice. 16,000 of Greenland’s 56,000 citizens live in the capital Nuuk. There are a further 16 cities with 500 to 5,500 people and some 60 villages with 20 to 500 people, plus some smaller settlements. Ilulissat is Greenland’s third city with some 4,500 people. 70 of them work at Hotel Arctic and 90 percent are native Greenlanders. “It is my policy to hire people from Greenland,” says the hotel’s general manager Erik Bjerregaard. He is Danish but has lived in Greenland for nearly 40 years. He has spent the past 20 years in Ilulissat where he has created the Hotel Arctic. He will not move “home” to Denmark. He and his wife love living here. Life is so much more than driving around on motorways. Greenland has no roads network. It is not possible to drive across the island or to drive from one city to the next. You either fly or take a boat when conditions allow. Transport is expensive and means people live in small cities or local communities isolated from each other. The infrastructure limits business development and tourism, but people living here get used to it. “Unemployment is high. Traditional jobs are disappearing and not all job seekers are able to get a job because they lack the education. Most workers in Greenland have no or little formal education. Then there are the social and health related challenges which prevent people from getting a job,” says Sanne Fandrup at Greenland’s Ministry of Industry, Labour and Trade. “I handpick all my employees,” says Erik Bjerregaard. He believes Greenlanders should be hired in Greenland. He has therefore started his own hotel school where students get their basic training in Greenland, get internships at Hotel Arctic and other hotels in Greenland. They sit their final exams in Denmark, which allows them to work wherever they want. The school offers an education and apprenticeships for people who want to be chefs, waiters and receptionists and it is a trailblazer in a sector faced with many challenges. With 80 percent inland ice and no road network, internal mobility is very limited in Greenland. “If I quit, or was fired, I would have very few alternatives, you would have to move cities. So the chances to move jobs are very limited. That’s why you often see that job ads include a place to live too. So a job is very important here in Greenland, and the chances to change jobs are very limited,” says Jeppe Eivind Nielsen. He has a lot of respect for the culture which surrounds him. “People are tough here,” says head chef Jeppe Ejvind Nielsen. He also has great respect for the hunters. He talks about the game hunt which happens twice a year; the reindeer hunt in the autumn and the muskox hunt in late winter. That hunt has just ended and the head chef has bought muskox to last him the rest of the year — two and a half tonnes. We see the evidence that evening. The starter is nature itself brought to the table, a large construction with rocks as a foundation and twigs arranged like sculptures with leaves shaped by fermented celery. The plate is decorated with whale skin. The main dish is muskox entrecôte on a soufflé with mushrooms and a game sauce. For desert: orange and white chocolate. The next day Julie and Josef Løvstrøm are gone. Finally the planes have been able to take off and the couple is on their way to the hospital in Nuuk. The Committee of Senior Officials for Labour has decided to fund a new design for the Nordic Labour Journal. visits Greenland to learn more about conditions there and to tell each other about new initiatives in their respective countries. Here on a trip to the ice edge in the snow (picture above).